We are driving the initiative called pre-clinicaltrials.org to accelerate preclinical drug discovery and biomarker validation. Our goal is that all contributing parties can draw samples and information from experiments performed on these samples from the biobank, thereby providing a rich source of material and information that could otherwise not be available within a single research group. All samples will be stored at the BioBank Maastricht UMC+ (www.biobank.nl) offering refrigerators, ultra-low freezers and liquid nitrogen tanks, as well as workup of individual samples according to researcher and biobank-predefined SOPs. It is ISO 9001 certified and ensures the safety of the biological collections using two emergency systems and back-up storage availability. Samples are registered in the web-based BioBank Information System (BIS), which is synchronised monthly with the pre-clinicaltrials.org database. 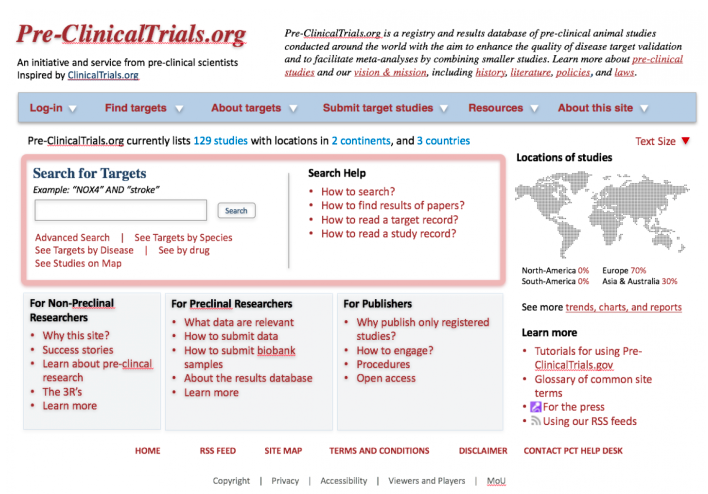 About 60% of all biomedical literature is not reproducible, yet pre-clinical basic research represents the basis to identify disease mechanisms, new drugs and diagnostics. One way forward is to introduce multicenter collaborative efforts such as pre-clinical trials and sharing data, samples and reagents. Here we unite these efforts on a global scale in pre-clinicaltrials.org and invite all biomedical researchers who are interested in elucidating mechanisms of diseases to contribute. All samples will be stored at the BioBank Maastricht UMC+ (www.biobank.nl) that is ISO 9001 certified and has all the necessary infrastructure and capacity. All information will be shared and publications stemming from your input will be collaborative. Contact us for our MoU and procedures. Together we can do it!